The all-new 2013 Chevy Silverado is sure to make an impression on truck buyers with its range of body styles, fuel-efficient powertrains, dependability, towing capacity and comfort. 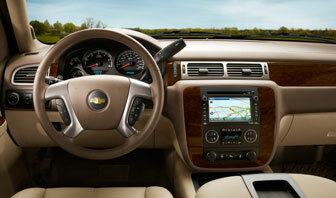 These features make the 2013 Silverado a truck that can handle any job. Whether you’re hauling equipment, transporting a crew or towing a family camper, the Silverado will exceed your expectations. The well-rounded engine options on the Silverado include a 4.3-liter Vortec V6 rated at 195 hp and 260 lb/ft of torque, a 4.8-liter Vortec V8 with 302 hp and 305 lb/ft of torque, a 5.3-liter Vortec V8 rated at 315 hp and 335 lb/ft of torque, and a 6.2-liter Vortec V8 with 403 hp and 417 lb/ft of torque. The Active Fuel Management (AFM) system and Variable Valve Timing (VVT) further optimize efficiency and all V8 engines can run on E85 FlexFuel, a fuel mixture of 85 percent ethanol and 15 percent gasoline. Drivers can expect up to 22 mpg on the highway from the Silverado XFE, and even up to 21 mpg highway from the 5.3-liter V8. New for 2013, all the six-speed automatic transmissions include Powertrain Grade Braking, which downshifts transmission gears. This reduces the need to apply the brakes on extended downhill grades and reduces the rotor temperatures to prevent brake failure and overheating. The powerful engines and automatic transmissions deliver a smooth ride and easy handling without compromising power. The regular-duty Silverado has an impressive maximum payload capacity of 1,937 pounds and a 7,000 pound maximum towing capacity. Optional features include an integrated trailer brake controller which aides the driver while towing, a Max Trailering Package with an upgraded towing rating of 10,700-pounds, and a rear vision camera. The Silverado comes in a range of trims to meet a wide variety of needs. Buyers can choose Work Truck (WT), LS, LT, XFE or LTZ models, as well as a hybrid. The Silverado Hybrid is still the only full-size hybrid pickup truck on the market. Silverado 1500 pickup trucks are available in Standard Cab, Extended Cab and Crew Cab styles. The truck also comes in three cargo box lengths: Short (five feet, eight inches), Standard (six feet, six inches) and Long (eight feet). The 2013 Silverado features a chiseled exterior and broad stance. The extended width of the truck lends extra stability, even when towing large loads. The body includes flared rear fenders, vertically stacked headlamps and a power-dome hood, giving the Silverado a contemporary look. The rear seat of the Silverado features a 60/40-split/folding design, with a center folding armrest on Crew Cab models. The one-handed controls allow for uninterrupted loading. Comfortable seats and a low step-in height make drivers and passengers happy. On Extended Cab models, the rear access doors open 170 degrees so passengers can enter and exit easily, and power-operated rear side windows lower completely. The very deep list of standard and available features and equipment for the Silverado––everything from rubberized vinyl floor covering and an automatic locking rear differential to leather-covered heated seats, Bluetooth and USB connectivity––means you can have as much utility and/or luxury as you want in your pickup. Silverado pickup trucks include several key features, such as a fully boxed hydroformed frame that is incredibly strong and durable. The design allows for fewer welds, strengthening the Silverado frame. Coil-over-shock front suspension, Hotchkiss rear suspension, and rack-and-pinion steering are also included. There are five suspension systems available on the Silverado, Z83, Z85, Z71, Z60, and NHT which are able to accommodate different driving conditions and needs, including Heavy-Duty Handling/Trailering, Solid Smooth Ride, Off-Road and High-Performance. All models come equipped with StabiliTrak® Electronic Stability Control linked to the four-channel Antilock Brakes. This minimizes trailer sway and provides superior hill-start assist on inclines greater than five percent. The StabiliTrak system minimizes the chance of a rollover crash by applying throttle and braking as necessary to keep the Silverado on the intended path. The 2013 Silverado features a strong, high-strength steel body structure built to absorb crash energy in an accident to protect passengers. Six airbags come standard on the Silverado, which includes head-curtain side airbags with rollover protection, seat-mounted side-impact airbags for thorax and pelvic protection and roof-mounted head-curtain airbags for unmatched rollover protection and superior occupant containment in the event of a crash. Other safety features are safety-belt pretensioners that minimize forward movement in a collision, along with load-limiting retractors. A standard Tire Pressure Monitoring System warns you when your tires are getting low on air and Remote Keyless Entry allows quick access into the truck. A high-capacity brake system with four-channel antilock brakes also standard. Six months of OnStar service come standard when purchasing a Silverado. OnStar has many useful emergency and convenience functions, such asAutomatic Crash Response, Stolen Vehicle Slowdown, Remote Door Unlock and Vehicle Diagnostics. There is also a RemoteLink Mobile App, which allows you to control Silverado functions, access vehicle info and send directions to your truck. A new service, FamilyLink, allows family members to track vehicle location. The Chevrolet Silverado is the most reliable truck on the road. Every truck comes backed by a five-year/100,000-mile Powertrain Limited Warranty and a three-year/36,000-mile Bumper-to-Bumper New Vehicle Limited warranty, so Silverado owners can enjoy peace of mind. Performance, options, durability and a rock-solid reputation for quality come together to create the 2013 Chevrolet Silverado. Stop by to see and drive one today. 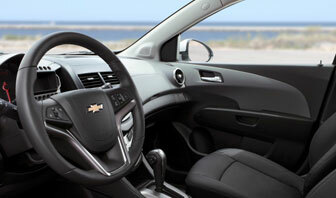 The 2013 Chevrolet Sonic four-door is a small car with a big attitude. It’s fun-to-drive, comfortable, seriously efficient, wildly well-equipped and quite affordable. Maybe that’s why it won the J.D. Power and Associates “Highest Ranked Appeal Among Sub-Compact Cars” award. The Chevrolet Sonic is the only sub-compact on the market built in the U.S. For 2013, the Sonic lineup adds an all-new, performance-inspired RS five-door hatchback model, as well as a Partial Zero Emissions Vehicle (PZEV) version of the standard 1.8-liter Ecotec four-cylinder engine. A new Chevrolet MyLink infotainment system is available and includes a seven-inch color screen, AM/FM/SiriusXM Satellite Radio, digital clock, Bluetooth streaming audio for music and phones, and voice recognition for compatible smartphones. New integral blind-spot mirrors have been added to the outside rearview mirrors on all models, and there are updated OnStar buttons. With so many features packed into the Sonic, it’s not surprising it was chosen as one of the “Best Family Cars” of 2012 by Edmunds.com and Parents magazine, and its interior was named one of Ward’s “10 Best Interiors” for 2012. The Chevrolet Sonic is available in four-door sedan (MSRP $14,185) and new five-door hatchback (MSRP $14,785) body styles and offers LS, LT, LTZ and RS trims. The RS is exclusive to the hatchback (MSRP $20,995). No matter what body style you choose, you will get class-leading roominess and cargo space. Chevrolet Sonic models are powered by a highly efficient 1.8-liter Ecotec four-cylinder engine that produces 138 hp and 125 lb/ft of torque. Also available is a turbocharged 1.4-liter Ecotec four-cylinder with 138 hp and 148 lb/ft of torque. The 1.4-liter turbo is standard on RS hatchback models. Transmission choices include a five-speed manual and a six-speed automatic with the 1.8-liter four, and a six-speed manual and six-speed automatic with the 1.4-liter turbo. The transmissions are equipped with a useful Hill-Start Assist feature which makes it easier to pull away from a stop on steep grades. Engineers who worked on the Corvette tuned the ride and handling of the Sonic to give it more precise handling. Sonic RS Hatchback offers stiffer, performance-oriented tuning, as well as a lowered (10 mm) suspension and four-wheel disc brakes. From every angle the Sonic Sedan and five-door Hatchback convey strength, stability and refinement. Aggressive design cues that include fender flares and motorcycle-inspired round headlamps are blended with global design cues such as the dual-element grille and round taillamps. A range of wheel sizes, including 17-inch alloy wheels, reinforce the sporty demeanor of the Sonic. With a strong body structure designed to absorb crash energy and provide a protective “safety cage” around occupants, and more than 60 percent of the body structure composed of advanced high-strength steel, the Sonic is safe car. It’s the only car in its segment to achieve an overall “5-Star” safety rating in National Highway Traffic Safety Administration (NHTSA) crash testing. The Sonic also earned a “Top Safety Pick” from the Insurance Institute for Highway Safety (IIHS). Other safety and security features include StabiliTrak Electronic Stability Control and rollover sensors, standard four-channel antilock brakes, seatbelt pretensioners that minimize forward movement during a collision and power assisted front and rear brakes. Ten standard airbags includes side-curtain airbags to provide head protection for outboard passengers in the event of a side-impact or rollover crash. The standard Tire Pressure Monitoring System ensures tires will never get dangerously low on air. OnStar with six months of complimentary service is standard. OnStar security and convenience services include Automatic Crash Response, Emergency Services, Remote Vehicle Unlock, Roadside Assistance, Turn-by-Turn Navigation and much more. There is also the OnStar RemoteLink mobile app, which allows a user to control Sonic functions, access vehicle info and send directions to the car. A new service, FamilyLink, allows family members to track vehicle location. The Sonic cabin is not just stylish, it’s functional, too, with storage compartments in the center console and doors. The rear seats fold almost flat for carrying larger items. In fact the Sonic sedan offers more trunk capacity than most compact cars, and the hatchback and sedan offer better rear-seat room than the Ford Fiesta. Also, with the seats folded flat, the Sonic hatchback has greater cargo capacity than the Fiesta. Front bucket seats are standard. The six-speaker MyLink audio system makes integrating your compatible smartphone and your stored media with the car’s radio. Just connect your smartphone via Bluetooth or a USB port and you can enjoy simple, safe and personalized media content, including Pandora Internet Radio and Stitcher SmartRadio. General Motors just named its 103rd landfill-free facility – the Components Holdings Lockport Plant – which achieved its landfill-free status by recycling or reusing all plant daily waste. The plant even recycles energy that would otherwise have been wasted, converting it into a useable resource. Recycling is a large part of this process. More than six-million pounds of aluminum, the main material used in vehicle heat exchangers, was recycled by the plant last year, and recycling of other byproducts, like cardboards, metals and plastics, has already generated revenues of almost $3.7 million this year. GM has been able to hit these great numbers by devising new solutions to roadblocks that would prevent large-scale recycling from being achievable. Teaming up with a recycling partner was one way the plant achieved this, working together to develop a technique for extracting and recycling specific metal byproducts that are formed when the heat exchangers are put together. These achievements have put GM on a great path towards helping the environment, and the company certainly isn’t done with its efforts. “We’re never done improving; achieving this milestone should instill even more excitement,” Curtis said. 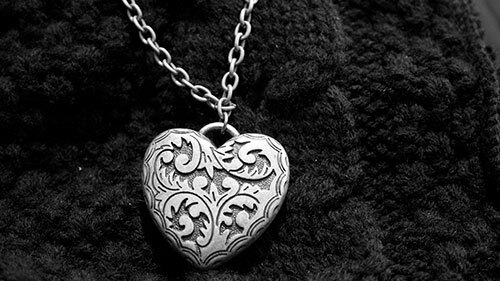 Valentine’s Day is a day to spend with your special someone, gathering memories and enjoying meaningful time together. Ohio has much to offer for Valentine’s Day, from chocolate-making to romantic hide-a-ways. Loveland, a small city northeast of Cincinnati, has been named the “Sweetheart of Ohio.” If you visit Loveland on an average day, you’ll see the city’s heart logo scattered throughout its streets. It’s on Valentine’s Day, however, that Loveland comes alive. The celebration begins weeks in advance. A special community Valentine’s Day Breakfast takes place on the morning of the romantic day. A poetry contest is held, and other celebrations are held through the holiday. Valentine’s Day is the only day of the year when non-residents of the city may reserve Loveland City Hall for weddings. For more information, contact the Loveland Chamber of Commerce at http://www.lovelandchamber.org or call (513) 683-1544. Spend an afternoon in decadence touring the Harry London chocolate factory. 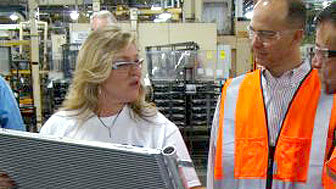 Located in North Canton, the factory gives daily tours every hour from 10 a.m. to 2 p.m., Monday through Friday. (Advance reservations are required.) After the tour, visit the retail store where almost 500 types of chocolate are displayed and ready for tasting. Call 1-800-321-0444 (ext. 119) to make a reservation for the tour or visit http://www.harrylondon.com. Although it’s still too chilly in February to enjoy all Lake Erie offers, views of the lake amaze visitors all year long. Spend an evening at The Lakehouse Inn and Winery in Geneva-on-the-Lake. Located on the banks of Lake Erie, the Lakehouse offers a romantic spa experience, restaurant, bed and breakfast, cottages and a fully-stocked winery. (Please remember to drink responsibly.) Visit http://www.thelakehouseinn.com for details. If an evening at home is more your style, opt for a home-crafted meal from Jungle Jim’s Market in Fairfield. With ingredients from all around the world, Jungle Jim’s brings foodies together in a way no other grocery store can accomplish. Spend an entire afternoon with your Valentine browsing the aisles of eclectic foods and then the evening preparing an intimate dinner together. Don’t forget to visit the bakery, where dessert cases are filled with decadent sweet treats. To learn more, visit http://www.junglejims.com. Become royalty for an afternoon or a weekend at the Ravenwood Castle in New Plymouth. Nestled in the hills of southeastern Ohio, the Ravenwood Castle provides the experience of visiting a British Palace. Dine for lunch in the Coach House Team Room, or visit for dinner in the castle’s grand hall (call for availability). If you’re staying the night, you can choose from castle accommodations or from the medieval cottages or fairy tale cabins. The Ravenwood Castle is a great choice for Valentine’s Day. Visit http://www.ravenwoodcastle.com for additional information. Experience Ohio during Valentine’s Day by visiting one of the state’s many unique and romantic locations.